© 2016 J.L PAYAN & ASSOCIATES INC. All rights reserved. Illinois ranks seventh for most Tornados in the nation, averaging 35 tornadoes each year. Hail causes $1 billion dollars in damage to crops and property each year. 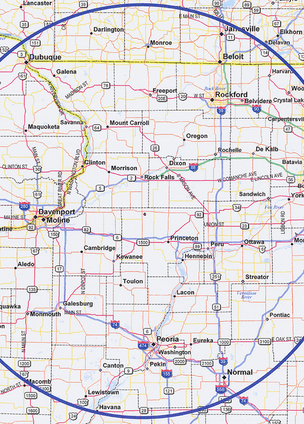 Our service area extends throughout all of northern and upper central Illinois. With corporate headquarters in Sterling Illinois, and Resident Adjusters located in Rockford Illinois and Geneseo Illinois, our team has the resources to serve your needs effectively and efficiently. Adjustment service billing is based on the closest location to the physical claim. Our central location and team of qualified property adjusters allows us to fully and professionally service the entire North Central Illinois region. imagery and indepth measurements. Please contact us for more information!